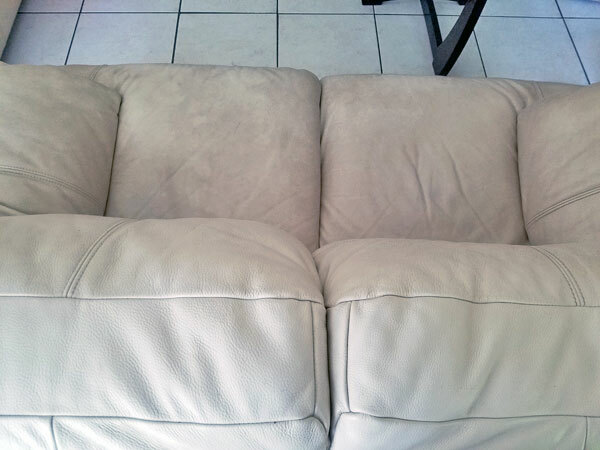 These photos show the dramatic results of a leather cleaning done by Chem-Dry of Tampa FL. 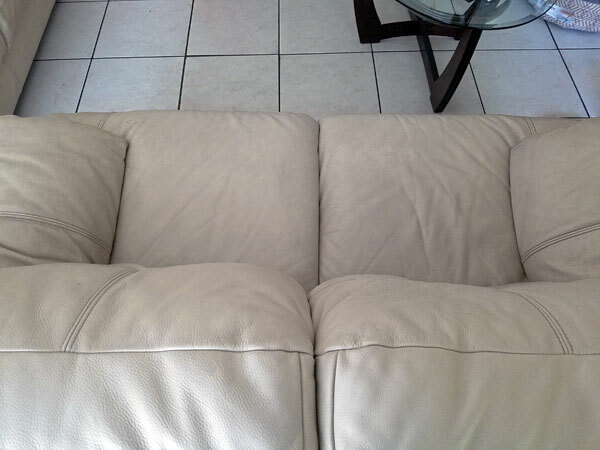 The photo on the left shows a cream leather sofa before cleaning. The picture on the right shows the same cream leather sofa after a professional leather cleaning treatment. We determined that after the leather cleaning the sofa had gotten 4 shades lighter and the overall brightness was increased. Foe those living in Tampa FL leather is a durable choice that offers some benefits over fabric upholstery coverings. It does not stain as easy, it can be cleaned quickly if something spills on it, and it has a luxurious look and feel to it. The important thing to remember about leather is that it needs to be cleaned just like other upholstered furniture. Most leather furniture has a grain or texture to it. That texture allows for dirt and skin oils to build up over time. That build up starts to darken the leather and can even degrade the grain in areas. If you decide to clean your leather furniture yourself make sure to use a leather cleaner and not a DIY cleaning solution. Leather can be sensitive to pH changes and can dry out or crack if a harsh cleaning solution is used on it. Even leather cleaners strip away essential oils that help maintain it's softness and pliability. After cleaning leather furniture needs to be condition or protected to replenish the oils that are removed. Our leather cleaning service includes a leather protectant that helps maintain the best parts of your leather furniture.